Everywhere I go with my army or terrain, people marvel at my headlights and interior illumination on my vehicles, or the red landing lights on my Skyshield Landing Pad. 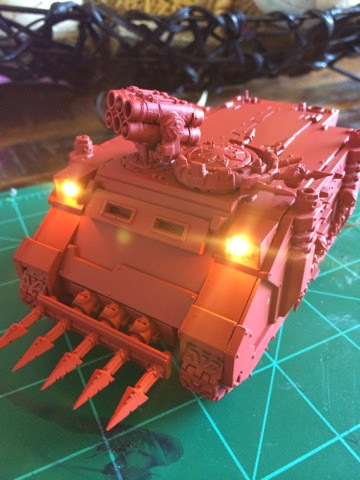 I went to my local Games Workshop store this Saturday and everyone couldn’t stop talking about how cool it was to have vehicles that lit up, and that they couldn’t do that sort of stuff. This got me thinking – those guys could easily do these sorts of things! 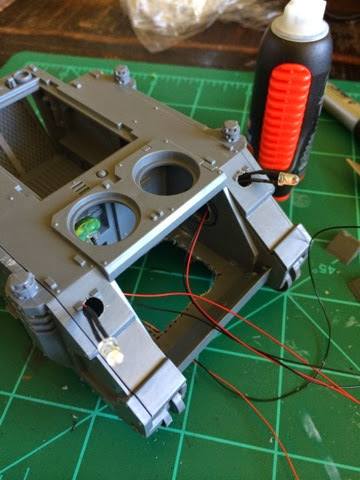 My land raider was the first time I’ve ever used LED wiring components in my entire life, and it was ridiculously easy. Much easier than I anticipated. 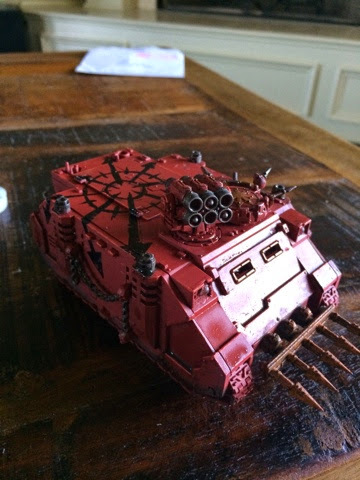 I’ve recently acquired a Rhino transport for my Berserkers (Note from the author: At the time of writing, I was hopelessly devoted to Khorne. These feelings have been purged from by soul and I am wholly devoted to the God-Emperor at this time – but I’ve already wired up three rhinos for my Imperial Fists, with a few more to go! Pictures at bottom. ), and figured I’d use this opportunity to do a step-by-step for anyone curious or scared at the idea of dealing with LEDs. All materials for wiring and lighting came from Evans Design. I find them to be the best quality, and alarmingly straightforward – they come pre-wired! You simply match the voltage (there are only two options) with the associated LED you want, and connect the wires. Twist black to black, and red to red and the connection is made, you’re good to go! The hardest part is deciding what colors you want! In my example below I used two 3mm “warm white” LEDs for the headlights and one 5mm Green for my interior lighting, all 3v. I also used the coin battery with toggle switch. 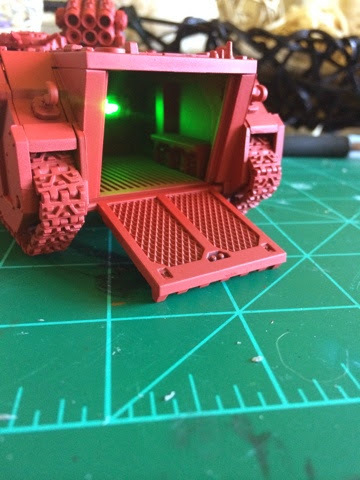 My Land Raider used the 5mm LEDs for its headlamps, if that gives you any indication on scale. You could make either work, honestly, so don’t get too worried with matching the size exactly. Without further ado, here’s my Rhino tutorial, but the project can be scaled up and made much more complex. This is simply a basic framework from which you can experiment and learn new techniques! 1. 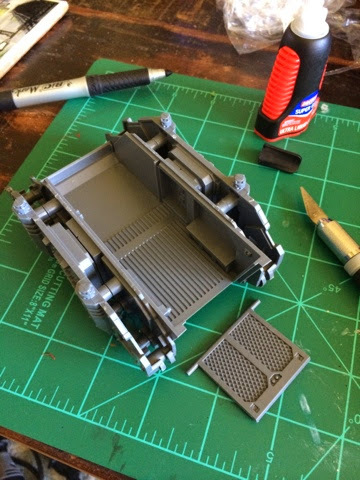 Always dry-fit the pieces together (especially vehicles!) to make sure there are no problems in later steps. This also gives you a broad view at where components will be placed, and allow moving parts to be accounted for. In this example, I’ve decided to put the battery and switch in the driver compartment (smooth surface) and the wiring in the track guards. The track guards on vehicles is usually the best place to route headlamp wires, as it’s out of sight of interior space. If you’re one of the guys that glues the rear ramps shut, you have much more room to play with, and can even fit a 9v battery in there for some serious “Christmas Tree” scenarios. 2. Here I’ve taken the Rhino apart again, and marked out where I’ll dremel out the gaps. The square below the driver compartment will be cut away and allow access to replacement batteries and the toggle switch – remember to make it large enough for fingers to manipulate the switch or remove a battery! The round holes is where the wiring will be fed to the headlamps. Not pictured are the top plates of the track guards, Ive drilled out the space where the headlamps connect as well. Be sure everything lines up and you have enough wire length to reach each of these places! 3. Starting to cut! These don’t need to be clean cuts, they’ll all be hidden once I’m done. 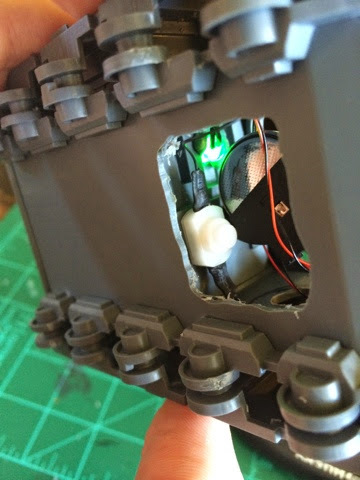 The sonar panel section on the command console was conveniently the same size as the 5mm interior green light I want to use, so will work well at disguising the light when not in use. 4. Dry-fit again! No glue should be used until you are 100% planned out on where things are going, and have double checked to be sure you know where wires are going. If I were to have glued at this stage, I would need to thread the headlamps from inside the cockpit, and out the front holes, which would be damn near impossible. Do this in separate stages while it’s all unglued, then fit it together once the wiring and LEDs are installed. 5. Threaded and glued! The careful observer will note that I made a big mistake here. See how the wires come out the front plate section (where the windshield would go)? That’s intended. 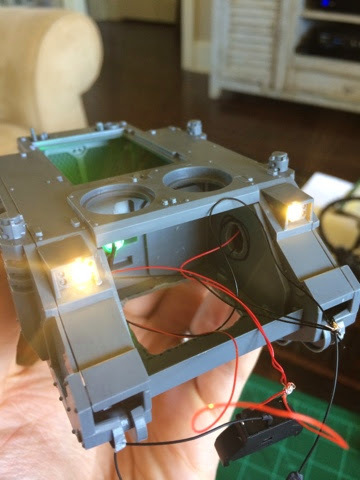 However, I accidentally threaded two of the wires from below the cockpit (you can see it running under the vehicle) to the interior green light (where the mash of greenstuff is). 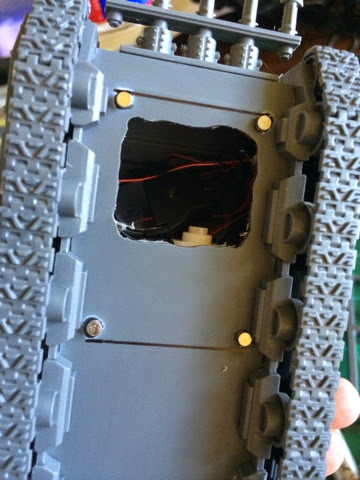 I have two sources of wire coming into the center, looped to a battery (out of frame), there is no way to get the entire assembly inside the vehicle! This meant I had to re-wire the connections, a very tedious (but doable) step that could have been easily avoided had I checked myself. Planning is everything! Take these steps slow, and be methodical, you’ll be happy in the end. 6. Wiring corrected as per previous step, and testing for good connections. No flickering, no dimming when the wires are jostled. Always check to be sure the connections are solid before gluing everything in. If a wire you twisted together comes loose after it’s built and painted, you’re probably not getting inside the track guards anytime soon. I twist and bend my connections, but a better recommendation would be to use electrical tape to make sure its secure. I try to be thorough, but I was too lazy to go buy tape for this demo. I wouldn’t recommend super glue or anything, as it will likely break the circuit connection. 7. Switch is glued into the bulkhead to give leverage when pressing it. Which is something I neglected on my Land Raider. On the Land Raider, having to pinch the unit by holding the back and pressing the toggle has taught me this lesson – hindsight is a powerful ally here, you’ll certainly make mistakes, but learn from them! Leave the battery free, however, as there’s almost no way to get a disc battery out without gripping the top and bottom. You’ll want the wires a little loose to pull out of the opening as well, to really make it easy. 8. (Optional): Magnets on the bottom will be used to secure a plate to keep the free-floating battery unit from falling out. It has enough friction and wires tangled up in there to not randomly fall out, but I wanted to be extra safe, as I did with the Land Raider. 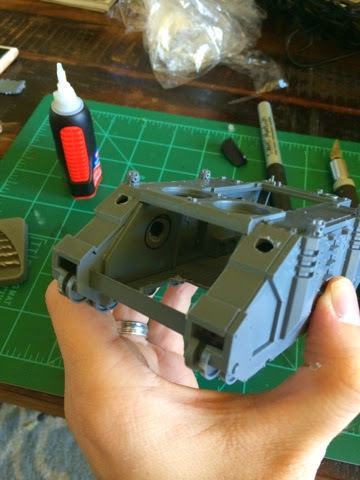 I eventually used a spare armor plate that came with the Rhino (the one to make it a Predator turret instead of a top hatch). 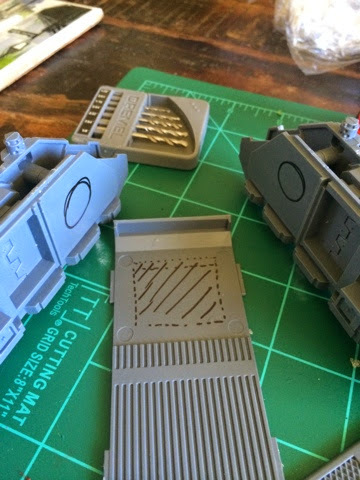 This isn’t as clean and well-hidden as the Land Raider (the rear power plant on the Land Raider is practically begging to be magnetized), but it serves the same purpose. 9. The lighting is done at this point – now it’s just painting! Tape your lights with a small amount of painter’s or masking tape. I spray my vehicles red, and if you do all this work just to spray over it, you’re not going to be happy. Scraping paint off of tiny LED bulbs isn’t fun – but it’s possible, should you forget. If you painted the interiors, be sure to tape closed the ramp so you don’t get any spillover onto a potentially finished interior. 10. Rear shot of interior light, and functional ramp. I strongly recommend painting interiors before assembling or lighting. I did on my Land Raider and was very pleased. 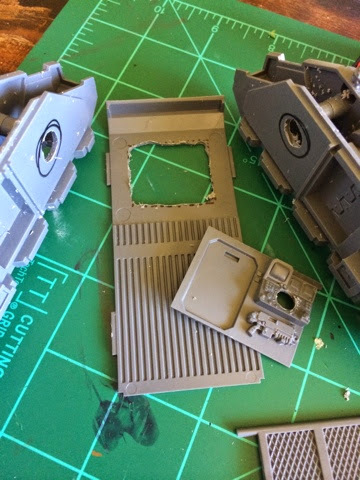 The Land Raider has several functional doors and an elaborate interior, so that was a given to paint it carefully. For this Rhino, I just gave it a quick once-over and was satisfied. I’ll do some detail work later if it strikes my fancy. I’ve heard shaving down the rounded LED top to a flat surface diffuses the light more – I’ve done this for all my interiors, and it appears to work. Failing to do this you get a circle of light projected straight out, something that isn’t conducive to an interior light! 11. Some freehand designs, a couple of washes, and some edge highlighting and I’m almost home free! I stopped here after only working a couple of hours – and could honestly be done at this stage. I’ll pick it back up later and detail and weather the model when I have a little more free time. The overall wash is drying in the image, so it looks a little wet. There you have it! A finished Rhino, totally illuminated with LEDs in under two hours. With the pre-wired kits from this website, I cannot stress how simple and effective it is to add a little something extra to your kits. The possibilities are endless! They have LEDs the size of a pencil-point! You could do Daemon’s eyes, individual cockpit indicators in a Valkyrie, terrain illumination – anything! The above method is simply a basic how-to, there can be a wide range of uses, so get to thinking! Give it a try, and let me know what you think below! If you have pictures of your own, please share them, follow me on Instagram (@hobbyvices) and interact with me there, or join the Google+ Warhammer 40k community and let everyone there know! Blood for the Blood God! LEDs for the LED throne! FOR TERRA! FOR THE EMPRAH!